For each stair specification & code citation we include links to in-depth articles providing more details. This article series lists all major building code specifications for stairs, railings, landings, and guardrails - information useful for constructing or inspecting indoor or outdoor stairs, railings, landings, & treads, and for evaluating stairways and railings for safety and proper construction. We compare stair and railing code requirements for various model, national, state and local building codes and we include explicit text & specifications from those building codes. Here we illustrate and summarize typical building code requirements for stairs, railings, landings, and guardrails. We also include references to key building codes that provide more detailed specifications for stair, landing, and railing safety. Because more people are injured by trips and falls than other hazards, experts have looked closely at the specifications for stairs, steps, and rails to reduce the falling hazards. This article has been adapted from specific stair and railing specifications that are similar among codes and countries (but not identical). -- IBC, IRC, BOCA, Kingston NY Stair Code, New York State Residential Building Code for Stairs (included here), Florida, Pennsylvania, New Jersey, & other sources. In-depth stair design articles listed at the ARTICLE INDEX the bottom of this article provide detailed descriptions of each stair feature, building codes, photographs and sketches of defects and requirements. Text comparing key provisions of several building code sections on stairs and rails is given at the end of this document. Sketch courtesy Carson Dunlop Associates. Stair component & topic summary specifications & codes are given in this article. At More Reading we give a complete list of in-depth individual articles about each stair component, code, & design point. Stairway handrail & stair balusters & guard details are in this sketch. See GUARDRAILS on BALCONIES & LANDINGSfor details. A summary is below. U.S. handrails for stairs with one side against a wall: 30-38"
Wall clearance: Handrails along a wall must have at least 1.5" of clearance between the inside surface of the rail and the wall surface. Railings should not project into the required width of the stairway by more than 4.5" at or below the handrail height above the stairs. Building exits, particularly in an emergency, are likely to be a source of additional injuries or worse if they are not properly constructed. Where a stairway is generally not used and falls into abandonment, such as a "second means of egress" that is not normally accessed, serious trip hazards often develop. 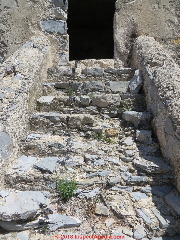 The exit stair shown here, from Real de Catorce, would be a disasater in an emergency. 1007.1 Accessible means of egress required. Accessible means of egress shall comply with this section. Accessible spaces shall be provided with not less than one accessible means of egress. Where more than one means of egress is required by Section 1014.1 or 1018.1 from any accessible space, each accessible portion of the space shall be served by not less than two accessible means of egress. 2. One accessible means of egress is required from an accessible mezzanine level in accordance with Section 1007.3 or 1007.4. 3. In assembly spaces with sloped floors, one accessible means of egress is required from a space where the common path of travel of the accessible route for access to the wheelchair spaces meets the requirements in Section 1024.8. 1. Accessible routes complying with Section 1104. 2. Stairways within exit enclosures complying with Sections 1007.3 and 1019.1. 3. Elevators complying with Section 1007.4. 4. Platform lifts complying with Section 1007.5. An enclosed exit stairway, to be considered part of an accessible means of egress, shall have a clear width of 48 inches (1219 mm) minimum between handrails and shall either incorporate an area of refuge within an enlarged floor-level landing or shall be accessed from either an area of refuge complying with Section 1007.6 or a horizontal exit. 1. Open exit stairways as permitted by Section 1019.1 are permitted to be considered part of an accessible means of egress. 2. The area of refuge is not required at open stairways that are permitted by Section 1019.1 in buildings or facilities that are equipped throughout with an automatic sprinkler system installed in accordance with Section 903.3.1.1. 3. The clear width of 48 inches (1219 mm) between handrails and the area of refuge is not required at exit stairways in buildings or facilities equipped throughout with an automatic sprinkler system installed in accordance with Section 903.3.1.1 or 903.3.1.2. 4. The clear width of 48 inches (1219 mm) between handrails is not required for enclosed exit stairways accessed from a horizontal exit. 5. Areas of refuge are not required at exit stairways serving open parking garages. The IBC Egress code also includes 1007.4: Elevators, 1007.5 Platform Lifts and 1007.6 Areas of Refuge - all of which can be read in the document cited just below. Above: my sister, Linda Ann is demonstrating an attractie but really too-big-to-grasp newel post at the bottom of a stairway in Mexico. Guards or guard rails referred to in stair codes and specifications refer to the safety barrier placed along the open sides of a horizontal walking surface such as a landing, balcony, deck, or porch. 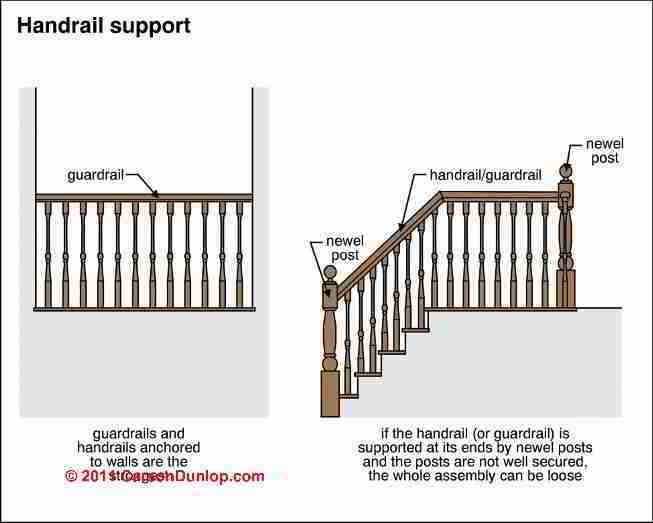 Quick definitions: What's the difference between a handrail and a guardrail? Handrails are intended to be grasped to assist the user in climbing or descending the stairway and to help prevent a fall. Guardrails are enclosures to prevent someone from falling through or off of a stairway, deck, balcony, etc. 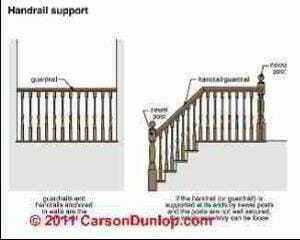 Note that in most codes it is permitted to make the stair guard or stair rail graspable, making it also usable as a stair handrail. But if the stair rail is not graspable, a graspable handrail must also be installed. Railings in stair codes and specifications refer to the safety barrier along steps or stairs. Also see GUARDRAILS on BALCONIES, DECKS, LANDINGS for details about safety railings on landings and open hallways, porches, screened porches, balconies - horizontal walking surfaces. Guards [guardrails] are required by section R316 for open sides of stairways, porches, balconies or raised floor surfaces located more than 30 inches above the floor or grade below, except for open sides of a flight of stairs with a total rise of 30 inches or less, although handrails are still required when there are two or more risers. Guards protecting floor surfaces must be 36 inches in height, while guards for stairs must be 34 inches in height measured vertically from the tread nosing. A guard may also serve as the required handrail (34 to 38 inches high) provided the top rail meets the requirements for grip size. The guard must have intermediate rails or ornamental closures that do not allow the passage of a 4-inch diameter sphere. The triangular openings formed by the riser, tread and bottom rail of the guard must be sized to prevent the passage of a 6-inch sphere. CABLE RAILINGS & GUARDRAILS - special considerations pertaining to horizontal and some vertical cable designs used instead of enclosures or balusters along guardrails. At RAILINGS, DECK & PORCH we provide deck, porch, and retaining wall safety railing design and building code details. There we cite several building codes that require safety railings at outdoor retaining walls, and we express the opinion that seating or a "seat wall" does not provide the equivalent safety as a properly constructed railing. A horizontal or sloping rail intended for grasping by the hand for guidance or support. Handrails have multiple requirements such as graspability, projection into the stairway, handrail height, & mechanical security rules. Complete details about handrails such as those used along stairs and ramps are at HANDRAILS & HANDRAILINGS Excerpts are bleow. Rectangular shaped: perimeter must be between 4" and 6.25"
Figure 4 (left) shows the recommended cross-section and dimensions of a good handrail. Ideally the cross-section should be round (diameter 4-5 cm, with circumference of 12-14 cm) to allow for a good firm grip. Guardrails of at least 40 cm above the surface of the stairs are needed to prevent falls off the side of the stairs that are not equipped with a banister. Details about safe graspable and unsafe non-graspable handrailings are found at GRASPABILITY of HANDRAILINGS. 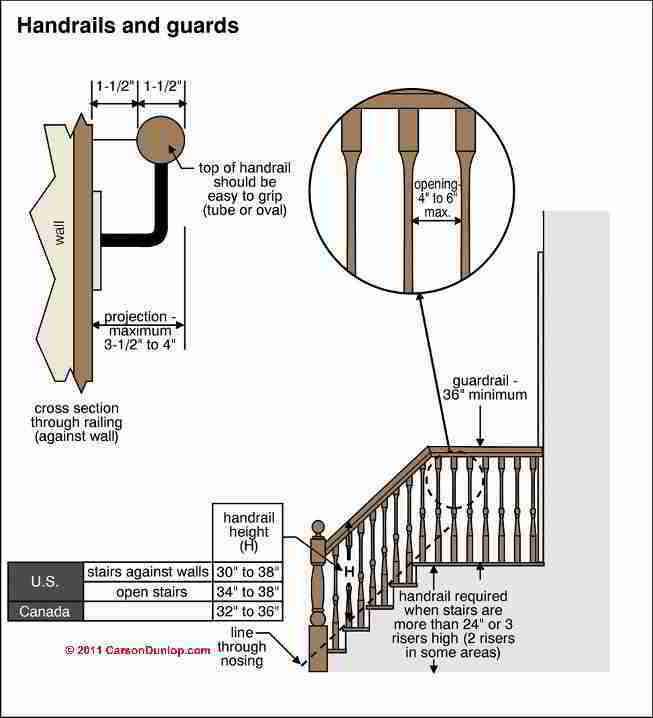 RCNYS section R315 requires stairways having two or more risers to have at least one handrail, at a height of between 34 and 38 inches above the nosing. There must be a clearance of at least 1 ½ inches behind wall mounted handrails. Handrails must be continuous from a point above the top riser to a point above the lowest riser of each flight of stairs. This would allow a newel post to be attached to the face of the bottom riser, with half of its base resting on the bottom tread. 2. The use of a volute, turnout or starting newel shall be allowed over the lowest tread. The section of a stairway leading from one landing to the next is a flight of stairs. Therefore, handrails are not required on landings [though guardrails might be if the landing is open - Ed.]. Continuous handrails are required on the side of where the tread is narrower for winders. The maximum variation in riser height and tread width is 3/8 inches to maintain uniformity in the flight. Handrail grips may be circular, 1 ¼ to 2 inches in diameter. If they are not circular the perimeter of the sides must total 4 to 6 ¼ inches with a maximum cross-section dimension of 2 ¼ inches. When the total perimeter of the sides exceeds 6 ¼ inches, a graspable finger recess complying with section R315.2 must be provided on both sides of the handrail. There are no dimensional provisions for newels. Above: a non-graspable railing along the top of a stair guard, Mexico City. The newel post at the landing is also sometimes used to arrest a fall. 1009.3.1 Dimensional uniformity. Stair treads and risers shall be of uniform size and shape. 2008 NYS Stair Code: R311.5.3.1 - Stair Riser height Requirements. The maximum riser height shall be 8 1/4 inches (209 mm). The riser shall be measured vertically between leading edges of the adjacent treads. The greatest riser height within any flight of stairs shall not exceed the smallest by more than 3/8 inch (9.5 mm.) (Courtesy Arlene Puentes). Stair riser heights shall be 7 inches (178 mm) maximum and 4 inches (102 mm) minimum. Stair tread depths shall be 11 inches (279 mm) minimum. The riser height shall be measured vertically between the leading edges of adjacent treads. The greatest step riser height within any flight of stairs shall not exceed the smallest by more than 0.375 inch (9.5 mm). Closed stair treads using a solid riser are shown at the left of the sketch and open stair treads are shown at the right sketch. Notice that the minimum stair tread thickness is increased when the stair tread is not supported by a solid riser. 1. Solid risers are not required for stairways that are not required to comply with Section 1007.3, provided that the opening between treads does not permit the passage of a sphere with a diameter of 4 inches (102 mm). 2. Solid risers are not required for occupancies in Group I-3. The notched stringer approach shown at left is very secure provided that the stringer depth is great enough and the cutout depth shallow enough that the remaining stringer material is strong enough to carry the weight of the stairway and its users (1-? arrow in sketch at left). The stair stringer may also support stair treads using grooves routed into the stringer, or stairs may be butted into the inner face of the stringer and nailed or screwed through the stringer opposite side - a dangerous approach that risks stair collapse if additional measures are not taken. Shown in our photo: worn stone stair steps at the Hacienda Jaral de Berrio, Mexico. These steps are a trip and fall hazard, increased by the absence of guard railings and handrails. The graeatest stair tread depth within any flight of stairs shall not exceed the smallest by more than 0.375 inch (9.5 mm). Winder treads shall have a minimum tread depth of 11 inches (279 mm) measured at a right angle to the tread's leading edge at a point 12 inches (305 mm) from the side where the treads are narrower and a minimum tread depth of 10 inches (254 mm). The greatest winder stair tread depth at the 12-inch (305 mm) walk line within any flight of stairs shall not exceed the smallest by more than 0.375 inch (9.5 mm). The nosings or leading edges of treads at such nonuniform height risers shall have a distinctive marking stripe, different from any other nosing marking provided on the stair flight. The distinctive marking stripe shall be visible in descent of the stair and shall have a slip-resistant surface. Marking stripes shall have a width of at least 1 inch (25 mm) but not more than 2 inches (51 mm). See STAIR DESIGNS for UNEVEN / SLOPED SURFACES for details. Step tread depth (=> 10") (measured 12" from smaller side of irregular stair shapes such as triangular treads on curves or spirals) [Stair tread depth is the horizontal distance from the nose of the tread to the back edge of the tread (where a vertical riser or open space may be found). The steep, thick wooden-tread stair shown here, located in Campo San Maurizio, Venice Italy, are old, creaky, and steep with minimal hand-rail, no top landing, and a too-short landing as shown in our photo. This stairway is what can fit in the available space. [The above specification of allowable variation in stair tread slope] was probably taken from the chapter on Means of Egress, in which case it is applicable to a means of egress, and not stairs outside the means of egress, like in a public way. It is very hard to maintain such tolerances for exterior sidewalks and public ways. Reply: the above discusses stair treads and does not refer to sidewalks - Ed. CONTACT us to suggest building code citations or stair tread specifications that vary from these. Also see STAIR TREAD SLOPE where we discuss slip hazards. 2008 New York State Stair Code R311.5.3.2: Tread depth. The minimum [stair] tread depth shall be 9 inches (229 mm). The tread depth shall be measured horizontally between the vertical planes of the foremost projection of adjacent treads and at a right angle to the tread's leading edge. The greatest tread depth within any flight of stairs shall not exceed the smallest by more than 3/8 inch (9.5 mm). Winder treads shall have a minimum tread depth of 10 inches (254 mm) measured as above at a point 12 inches (305) mm from the side where the treads are narrower. Winder treads shall have a minimum tread depth of 6 inches (152 mm) at any point. Within any flight of stairs, the greatest winder tread depth at the 12 inch (305 mm) walk line shall not exceed the smallest by more than 3/8 inch (9.5 mm). (Courtesy Arlene Puentes). Stair riser heights shall be 7 inches (178 mm) maximum and 4 inches (102 mm) minimum. Stair tread depths shall be 11 inches (279 mm) minimum. The riser height shall be measured vertically between the leading edges of adjacent treads. The stair tread depth shall be measured horizontally between the vertical planes of the foremost projection of adjacent treads and at right angle to the tread's leading edge. Tread Nose not required if tread depth is => 11"
1009.3.2 Profile. The radius of curvature at the leading edge of the tread shall be not greater than 0.5 inch (12.7 mm). Beveling of nosings shall not exceed 0.5 inch (12.7 mm). Risers shall be solid and vertical or sloped from the underside of the leading edge of the tread above at an angle not more than 30 degrees (0.52 rad) from the vertical. The leading edge (nosings) of treads shall project not more than 1.25 inches (32 mm) beyond the tread below and all projections of the leading edges shall be of uniform size, including the leading edge of the floor at the top of a flight. Reader question: is this doubled stair tread nose acceptable? I am looking for information on stair noses. I am having hardwood flooring installed in a home that previously had carpet and vinyl. The stairs are pine that previously had carpet installed over them and were not finished at all. The current hardwood floor installer has installed the top stair bullnose, that ties into the upstairs flooring, right over the existing bullnose so that two rounded edge bullnoses are visible. The installer refuses to trim the nose flush to the riser so that only one bullnose is visible stating that trimming the nose/lip would effect the integrity of the stairs. To confirm this is only the top stair that ties into the floor. It looks very bad aesthetically. While building codes cannot anticipate every possible way that a stair-builder can foul up a set of stairs, in our OPINION the stair tread nose shown below is a trip hazard, principally because of its double thickness. The stair tread double-nose photograph above, provided by the InspectApedia.com reader, appears to violate the stair tread nose curve radius and stair tread nose profile (greater than 1/2-inch). A double-thick stair tread nose may catch the tip of a shoe, particularly when ascending the stairway. In my vew these treads need to be repaired. I would trim back the under-tread to flush with the riser face - a job taht would have been easier before the top level of flooring was installed (and may be a too-thin tread nose). Watch out: if the double layer of walking surface was installed only on the topmost step (the floor) then the riser heights of these stairs may also be inconsistent by 3/4" at the topmost step - another trip and fall hazard. 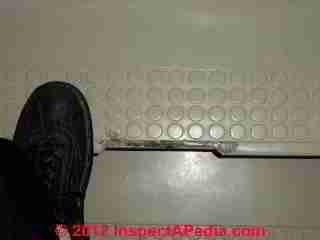 2008 New York State Stair Code R311.5.3.3: Stair Tread [nose] Profile. The radius of curvature at the leading edge of the [stair] tread shall be no greater than 9 / 16 inch (14.3 mm). A nosing not less than 3/4 inch (19 mm) but not more than 1 1/4 inch (32 mm) shall be provided on stairways with solid risers. The greatest [stair tread] nosing projection shall not exceed the smallest nosing projection by more than 3/8 inch (9.5 mm) between two stories, including the nosing at the level of floors and landings. Beveling of [stair tread] nosing shall not exceed 1 / 2 inch (12.7 mm). Risers shall be vertical or sloped from the underside of the leading edge of the tread above at an angle not more than 30 (0.51 rad) degrees from the vertical. Open risers are permitted, provided that the opening between treads does not permit the passage of a 4-inch diameter (102 mm) sphere. Another Stair Code Example of stair tread nose profile and projection - BOCA 2001. Stair tread nose projection missing or wrong dimension: (falling hazard on descending) or tread nose extends out too far over tread (risk splitting off or trip on climbing up). Example: A nosing not less than 0.75 inch (19.1 mm) but not more than 1.25 inches (32 mm) shall be provided on stairways with solid risers where the tread depth is less than 11 inches (279 mm). - BOCA 2001. Reader Question: are stair tread nose projections actually a trip hazard? My father-in-law has tripped several times on his stairs and blamed the protruding nosing. He asked me why stairs have nosings and I had to confess that I didn't really know. I did some research on tripping and protruding nosings and found that the Australian code does not allow open risers or protruding lips/nosings on stair treads precisely because they are a trip hazard for the disabled. It is interesting, then, that this article mentions that a stair MUST have a protruding nosing of min. 3/4" to max. 1-1/2". Can anyone explain why this is so when such a lip can so easily catch a toe of someone climbing a stair? 1009.5.1 Stairway walking surface. The walking surface of treads and landings of a stairway shall not be sloped steeper than one unit vertical in 48 units horizontal (2-percent slope) in any direction. Stairway treads and landings shall have a solid surface. Finish floor surfaces shall be securely attached. Exception: In Group F, H and S occupancies, other than areas of parking structures accessible to the public, openings in treads and landings shall not be prohibited provided a sphere with a diameter of 11/8 inches (29 mm) cannot pass through the opening. 1009.5.2 Outdoor conditions. Outdoor stairways and outdoor approaches to stairways shall be designed so that water will not accumulate on walking surfaces. In other than occupancies in Group R-3, and occupancies in Group U that are accessory to an occupancy in Group R-3, treads, platforms and landings that are part of exterior stairways in climates subject to snow or ice shall be protected to prevent the accumulation of same. [Not found in NYS Code] - A walking-surface that provides a coefficient of friction of 1.02 dry and 0.98 wet will comply with ADA, OSHA, and most local building codes and insurance requirements. This requirement is reiterated in our summary of Canadian OSH stairway rules below. SLIPPERY STAIRS, WALKS - Algae, Ice, Fungus, Wet Surfaces & Other Stair Slip, Trip & Fall Hazards. EXTERIOR STAIR FALLS - a catalog of causes of falls on stairs that includes surface conditions and other defects. While individual stair riser heights and tread dimensions determine the walking comfort and safety of stairs and stairways, here are some typical overall slope specifications that characterize different types of building entrances and exits. Accessible stairs, slope 30 to 32.5 deg. Egress stairs and accessible egress stairs for primary emergency exit from a building, slope 30-32.5 deg. Fire escape stairs (for emergency use only, not intended for normal use to enter or exit the building), slope 30-50 deg. You can see from the sketches below the recommended range of slopes or angles for various types of ramps, stairs and ladders. STAIR RISE & RUN CALCULATIONS - an explanation of how we convert the distance traveled horizontally and vertically between floors or landings into proper stair tread and riser dimen sions. Exceptions, depending on the nature of space therein and how it is used may be at ATTIC STAIR CODES & HAZARDS or at BASEMENT STAIRS. For example an attic used only as a utility or mechanicals area, not for normal occupancy, may permit steeper stairs and other variations. at STAIR PLATFORMS & LANDINGS, ENTRY. A summary is below. 1009.4 Stairway landings. There shall be a floor or landing at the top and bottom of each stairway. The width of landings shall not be less than the width of stairways they serve. Every landing shall have a minimum dimension measured in the direction of travel equal to the width of the stairway. 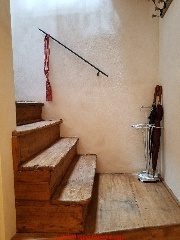 Such dimension need not exceed 48 inches (1219 mm) where the stairway has a straight run. Section R312 requires a floor or landing at the top and bottom of each stairway and on each side of each exterior door. The exception provides that on all exterior doors, except the required main exit door, where there are two or fewer risers, a landing is not required. Section R312.1.2 also provides that at the required main exit door, the landing be no more than 1 ½ inches lower than the top of the threshold, while landings at all other exterior doorways may be as much as 8 ¼ inches lower than the threshold. Landings at required exit doors. In lieu of compliance with section R312.1.2 of the Residential Code of New York State, an exit door required by section R311.1 of the Residential Code of New York State may have an exterior landing which is not more than 8 ¼ inches (209 mm) below the top of the threshold. With this amendment, there is no longer a requirement that the level of the landing outside the required main exit door be limited to no more than 1 ½ inches below the threshold. Additionally, landings have to be at least as wide as the door or stairway and at least 36 inches long measured in the direction of travel. Landings are required on the exterior side of a sliding glass door when served by a stair having more than two risers. A 6-0 x 6-8 sliding door (even if it is an emergency escape and rescue opening required in a sleeping room) is still a door and requires a landing per section R312.1.2. Considering only the operable part of the sliding door, the width of the landing does not need exceed 36 inches. It would also be permitted to install a guard on the exterior of the sliding door in lieu of the required landing and stairs when the door threshold is more than 30 inches above grade. Stairways are regulated by section R314 and include winders, spiral stairs, circular stairs, and bulkhead enclosure stairs. Stairways shall be not less than 36 inches in clear width at all points above the handrail height and the handrail may project no more than 4 ½ inches on either side of the stairway. Thus, the minimum clear width of a stairway at or below the handrail, when one is required, is 31 ½ inches, and 27 inches where two are required. Stair trim, stringers and other features may reduce the stairway width as long as they do not extend beyond the allowable handrail projection. There is a width exception for spiral stairways. The maximum riser height is 8 ¼ inches and the minimum tread depth is 9 inches. Open risers are permitted provided the vertical opening between treads does not permit the passage of a 4-inch-diameter sphere in stairways which have a rise exceeding 30 inches. The minimum headroom is 6 feet, 8 inches measured vertically from a sloped plane along the tread nosings or from the floor or landing surface. 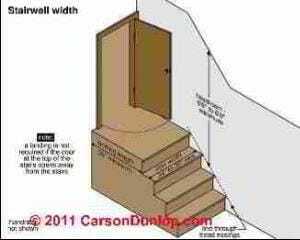 at STAIR DIMENSIONS, WIDTH, HEIGHT. at BASEMENT STAIRS depending on how these areas are used or intended to be occupied. Sketch at above right, courtesy Carson Dunlop Associates. 1009.10 Alternating tread devices. Alternating tread devices are limited to an element of a means of egress in buildings of Groups F, H and S from a mezzanine not more than 250 square feet (23 m2) in area and which serves not more than five occupants; in buildings of Group I-3 from a guard tower, observation station or control room not more than 250 square feet (23 m2) in area and for access to unoccupied roofs. Shown above: alternating tread stairs used to access a rooftop utility area, Guanajuato, Mexico. Courtesy D.P. & L.M. Scissors stairways may be installed to avoid crowding or safety issues between people ascending and descending between building floors - where you may see an UP staircase marked separately from a DOWN staircase. Stairways shall have a minimum headroom clearance of 80 inches (2032 mm) measured vertically from a line connecting the edge of the nosings. Such headroom shall be continuous above the stairway to the point where the line intersects the landing below, one tread depth beyond the bottom riser. Headroom is allowed to be reduced to 78" over spiral stairs in some codes such as New York State. Sketch showing stairwell width and landing details is provided courtesy Carson Dunlop Associates. Stairwell width and stair landing platform requirements are summarized by this sketch. The minimum recommended stair width is between 34" and 36" ACROSS. The minimum recommended stair landing length is 36" (or a length and width sufficiently greater than the swing of the door if a wider door is present. Notice that a stair top landing is not required if the door at the top of the stair opens away from the stairwell. In these sketches required handrails have been omitted for clarity. 1009.1 Stairway width. The width of stairways shall be determined as specified in Section 1005.1, but such width shall not be less than 44 inches (1118 mm). See Section 1007.3 for accessible means of egress stairways. 1009.6 Vertical rise. A flight of stairs shall not have a vertical rise greater than 12 feet (3658 mm) between floor levels or landings. This means that if the floor to floor height traversed by a stairway is more than 12 feet of vertical distance, one or more landings is required. Fire stopping for stairs is required to slow the spread of building fires between floors and to assist in emergency exit. Sketch courtesy Carson Dunlop Associates, a Toronto home inspection, report writing & education company. Sample excerpts of sources which a building code compliance inspector would be expected to cite in support of requiring a properly-designed, properly-secured guard rail include but are not limited to the citations below. In the REFERENCES section of this article you will find more model codes and other key documents on building codes and stair and railing safety. Continue reading at BUILDING CODES for STAIRS or select a topic from closely-related articles below, or see our complete INDEX to RELATED ARTICLES below. 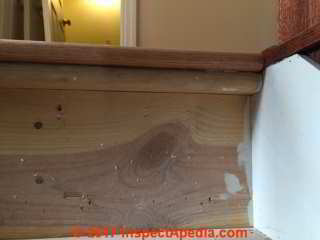 CODES for STAIRS & RAILINGS at InspectApedia.com - online encyclopedia of building & environmental inspection, testing, diagnosis, repair, & problem prevention advice. Abstract: Using a surface forces apparatus, we have investigated the adhesive and lubrication forces of mica surfaces separated by a molecularly thin, subnanometer film of a high-molecular-weight (2.3 MDa) anionic polysaccharide from the algae Porphyridium sp. adsorbed from aqueous solution. The adhesion and friction forces of the confined biopolymer were monitored as a function of time, shearing distance, and driving velocity under a large range of compressive loads (pressures). Although the thickness of the dilute polysaccharide was <1 nm, the friction was low (coefficient of friction = 0.015), and no wear was ever observed even at a pressure of 110 atm over 3 decades of velocity, so long as the shearing distances were less than twice the contact diameter. Atomic force microscopy in solution shows that the biopolymer is able to adsorb to the mica surface but remains mobile and easily dragged upon shearing. The adhesion (adsorption) of this polysaccharide even to negatively charged surfaces, its stable low friction, its robustness (high-load carrying capacity and good wear protection), and the weak (logarithmic) dependence of the friction force on the sliding velocity make this class of polyelectrolytes excellent candidates for use in water-based lubricant fluids and as potential additives to synovial fluid in joints and other biolubricating fluids. The physical reasons for the remarkable tribological properties of the ultrathin polysaccharide monolayer are discussed and appear to be quite different from those of other polyelectrolytes and proteins that act as thick “polymer brush” layers.